PayPal is a scheme for transferring money over the Internet. PayPal is cross between a bank, a credit card company, an affiliate program, a shopping cart service, a smart card, digital cash and the Western Union. You have an account which you can fill from your credit card (Visa, MasterCard, Discover or Amex) or bank account or debit card. You can transfer money from that account to your bank account. Other people with PayPal accounts can give you money and you can give them money. The transaction fees are relatively low under 4.9% and $.55 per transaction. However, that means on a $1 donation, they take over a third. You can set up a shopping cart on your website in an afternoon. It is the simplest and most flexible shopping cart scheme I have seen. Buyers can transfer money to vendors in US dollars, Euros or pounds sterling. Buyers and vendors can also transfer money to and from their bank accounts in other currencies. You can keep separate accounts in Canadian and US dollars. People are using PayPal to speculate in currency exchange fluctuations, or to transfer money out of the sinking dollar into other more stable currencies. An authorisation is permission for a delayed payment. So for example, when you order something not in stock, you may give the vendor an authorisation to take money out of your PayPal account in future, when he actually ships the product. He may put a hold on your account for the amount to ensure you have that much money when the time comes. paid by the seller, (i.e. the recipient of the money.). The British competitor moneybookers, has considerably lower fees, but is not accepted as widely. You might consider using it for person-to-person transfers. Credit cards are hopelessly inept and insecure for Internet purchases. It is only a matter of time before their use is totally discontinued. PayPal offers a secure though costly alternative. The big advantage of PayPal is you divulge only your email address to the company your are paying. With a credit card, you must give them your credit card and expiration date. They can use that to make further unauthorised charges to your account, or sell the number on the black market. With PayPal the person you are paying cannot take further money or change the amount. With PayPal you can put money in escrow with an authorisation. This proves to the e vendor you have the money, but does not let him withdraw it until he has delivered the goods. With PayPal you have access to neutral arbitration over a disputed payment, e.g. when you paid but goods never arrived. Similar services from credit card companies are highly biased toward the vendors. A fraudster cannot steal more than the contents of your PayPal account. With a credit card, he can rack up charges often past the spending limit. PayPal is much more secure than a credit card. With a credit card, all a fraudster needs is your credit card number and the expiry date (something written on the card in plain text). With PayPal a fraudster needs to know your email address and your PayPal password. You never reveal your PayPal password to anyone and ideally never write it down or store it in your computer unencrypted where a hacker might find it. You can monitor the state of your PayPal account online. Further, PayPal sends you emails any time the balance changes. If a fraud ever happened, you would know about it right away. In my experience the Chrome browser does not work with PayPal. Try Firefox. When you load up your PayPal account from your bank account they take the money out of the bank about 2 days later then sit on it for 14+ days before putting it in your PayPal account. They advertise 3 - 4 days. It is bad enough they pay no interest on your account without sitting on your deposits for two weeks without interest and without giving you access to it. Originally PayPal planned to be a free service, funded completely by this float and by lending out the money in the accounts, the same way free travellers cheques are funded. They have almost no expenses for a transaction. They just subtract the amount from one account and add it to another, no more work that a typical HTML (Hypertext Markup Language) page fetch. The only expense they have is resolution of a disputed transaction, when the parties cannot come to an understanding with only automated mediation. Even after they send you an email saying the money is available. Even after the money shows up in the balance, you cannot necessarily spend it. It takes a while longer to become truly available. Since it takes two weeks plus to load your PayPal account up from your bank account, it means you need to maintain a fairly hefty balance in your PayPal account that earns no interest. PayPal fees are pretty steep when you consider how cheap it is for them to process the transaction and that they get to keep your balance in a bank somewhere earning interest for them and none for you. Consider that travellers’ cheques, which require even more processing, are free. PayPal could be free and still generate hefty profits. PayPal is a somewhat unethical company. For example, they ask you to participate in what appears to be anonymous surveys, but encode your identify in the URL (Uniform Resource Locator). PayPal must drive the homeland security people crazy. You can set up accounts without ID and send money all over the world from people/business/organisation to people/business/organisation. The volume of transactions must be astounding. You can effectively launder money by buying goods online and reselling them or by simply transfering money. The high fees and presumed transaction limit might discourage illegal use. PayPal is subject to phishing, phony emails attempting to get your PayPal password or bank account numbers. Here are some ways to avoid being taken. If you receive an email and are unsure whether it is from PayPal, open a new web browser (e.g., Internet Explorer or Netscape) and type in the following: https://www.paypal.com/. Don’t click on any link in an email which seems suspicious to you. Changing your password is quite a production. The form to change it is hidden under My Account ⇒ bank ⇒ password. They ask you to key your full bank account. They don’t mean that. They mean your partial bank account without the institution and transit fields. You have to type your new password twice. You can’t just paste it in from your password generator. You have literally key it and to make matters worse, you must type it both times blind. It took me a couple of dozen tries to mollify PayPal. Paypal is probably your most important password. I wrote PayPal with a number of ideas to make it easier in order to encourage people to change their passwords more frequently. Some spoof websites will send emails that pretend to come from PayPal to entice you to log in at the spoof URL. Be extremely cautious of emails that direct you to a website that asks for sensitive information. If you have surrendered financial or password information to a suspicious email or website, promptly report this to the issuing institution as well as change your password and secret answers on your PayPal account. This can be completed in the Profile section of your account. PayPal will never send you an email with the greeting Dear PayPal User or "Dear PayPal Member". Emails initiated by PayPal will address you by your first and last name, or the business name associated with your PayPal account. When using the PayPal service, always ensure that the URL address listed at the top of the browser is https://www.paypal.com/. The s in https ensures that the website is secure. Even if the URL contains the word PayPal, it may not be a PayPal webpage. Look for the 'lock' symbol that appears in the lower right hand corner of the Internet Explorer browser. This symbol indicates that it is a secure site. Do not download attachments, software updates, or any application to your computer via a link you received in an email. PayPal will not ask you to download anything for your account to work. Use a unique password for the PayPal account and change it every 30- 60 days. The password should be one that is not used on any other site, service, or login. If you think you have received a fraudulent email including the header information or the site’s URL, please forward the original email to spoof@paypal.com and then delete the email from your mailbox. Never click any links or attachments in a suspicious email. PayPal is not secure over public WiFi (Wireless Fidelity) such as in a cafe. Crooks can see your password. Sign up with a business account. Finding your way around the PayPal Website can be daunting. Here are some key locations that work once you have logged in. create a Buy Now button. Use the encrypted form so spam harvesters will not see your email address embedded in the generated HTML. create a Please Donate button. accept PayPal logo. Sometimes the page fails to show any logos or HTML. Try a different browser. accept credit cards via PayPal logo. Sometimes the page fails to show any logos or HTML. Try a different browser. other PayPal logos. Sometimes the page fails to show any logos or HTML. Try a different browser. Twice on 2014-08-09, at different sites, when I made a PayPal purchase, the vendor send me to PayPal to pay for the product, without taxes or shipping, then sent me a second time with taxes and shipping included. Don’t click pay unless everything is incorporated in a single payment or you could be stung paying twice. Michael Ruppert was a political activist who opposed the Iraq war. PayPal blocked the donations to his website. This is unwarranted political interference. What Ruppert was doing was completely legal. Bed Bath and Beyond $20 off with $100 PayPal purchase. CardSwap: exchange gift cards for various stores. Who Does Not Take PayPal? Write the vendor, (paper and snail mail works better) explaining your problem. They will often make an exception and allow you to pay by cheque or money order. In Canada the credit unions let you send money via email just like PayPal via Interac. The difference is, you can send it direct from your account. You don’t have to wait a week or so to transfer money to your no-interest PayPal account first. They charge the sender a flat $1.50 fee, which is someone cheaper that PayPal which charges the receiver. Interac has extra security. The receiver must answer a question posed by the sender. This is primarily of interest to vendors who want to get fancy with using PayPal to take payments. This is more of an introduction and overwiew. 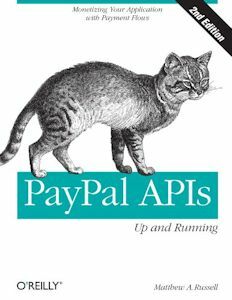 Believe it or not, even a book of this size just scratches the surface of the PayPal API.